Multiracialism cuts its teeth on the denial of this fundamental social truth: not simply that antiblackness is longstanding and ongoing but also that it is unlike other forms of racial oppression in qualitative ways-differences of kind, rather than degree, a structural singularity rather than an empirical anomaly. Jared Sexton, Amalgamation Schemes: Antiblackness and the Critique of Multiracialism, (University of Minnesota Press, 2008), 245. This Sunday is the anniversary of the end of one of the greatest comic strips of all time. On June 25, 1944, the final installment of “Krazy Kat” was published, two months after the death of its creator, George Herriman. In various forms since 1910, the strip’s essential paradox — Ignatz, a mouse, forever beans Krazy with bricks, who nevertheless loves him back — yielded seemingly inexhaustible variations. In its day, “Krazy Kat” was more a critical than a popular favorite, though publisher William Randolph Hearst, a fan, continued to give Herriman carte blanche despite the strip’s sometimes meager readership. But its dreamlike artwork, linguistic fantasy, and self-referential tinkering with comic-strip form influenced numerous other art forms — music included. The dense, idiosyncratic argot of Herriman’s dialogue and his precisely-dashed linework and zig-zagging scenery (a stylization of Herriman’s beloved southwestern landscapes) found its musical counterpart in syncopation. As early as 1911 — only a year after Krazy and Ignatz first appeared in the margins of Herriman’s strip “The Dingbat Family” — a New York composer-pianist named Ben Ritchie published “Krazy Kat Rag,” with a Herriman illustration on the cover. In later years, saxophonist Frankie Trumbauer’s Orchestra (which included such jazz luminaries as Bix Beiderbecke, Eddie Lang, and Joe Venuti), expatriate bandleader Sam Wooding, and clarinetist Artie Shaw all recorded “Krazy Kat” tributes. Michael Tisserand, Krazy: George Herriman, A Life in Black and White. Harper, 2016. 550 pp, $35. Michael Tisserand’s Krazy: George Herriman, a Life in Black and White, a work of passion and sagacity, not only gives a comprehensive overview of Herriman’s oeuvre but insightfully situates it in personal and socio-cultural context. 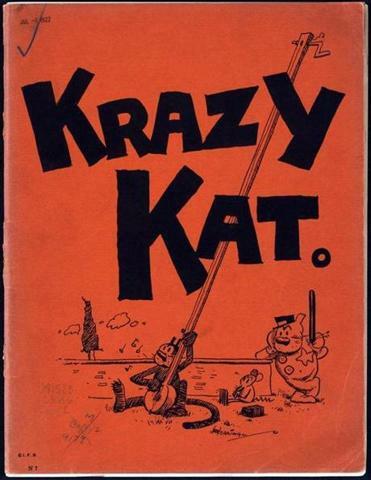 Krazy Kat is perhaps one of the most lauded newspaper comic strips of all time, and yet this is the first book-length biography of its creator. Nine years in the making, Tisserand’s book has been much anticipated by scholars and fans of the artist. As suggested by the double meaning of the title, Tisserand argues that an awareness of Herriman’s complex racial background is central to reading both Herriman’s life and his work. Herriman was listed as “col.” (or “colored”) on his New Orleans birth certificate and “Caucasian” on his California death certificate—and these two arbitrary classifications form the frame to Tisserand’s study. Tisserand’s prose has a lively clarity learned from a career working extensively as a journalist, and this comprehensive biography will certainly be sought out by both academic and lay audiences interested in newspaper comics, or comics in general. As an exhaustive historical account of Herriman’s life, it will be an indispensable resource for scholars working in sequential art; thanks to Tisserand’s meticulous research, even those deeply familiar with Krazy Kat will cull new insights from the details he has unearthed. Perhaps most importantly, this comprehensive and nuanced account of Herriman’s life and work in parallel in a single volume reveals new depths to the “komplexities” of the Krazy Kat with whose challenges many of us thought we had already grappled. Part 1, “Watta Woil,” opens with an account of the posthumous uncovering of Herriman’s ambiguous racial heritage by scholars in the 1970s, and the debates that ensued: How reliable was this information? To what degree was Herriman aware of his racially mixed background? What is the relevance of racial identity for understanding Herriman’s work? Tisserand ends the opening chapter with a question that resonates throughout the rest of the book: “Did this revelation, whatever it was, find its way into his wondrous comics? Is it a source of the wonder?” Tisserand then describes in detail the complicated web of Herriman’s mixed-race ancestry and the challenges his ancestors faced during the post-Civil War and Jim Crow eras; some of the most powerful moments in this section are provided by the concrete, personal, and tragic features of the racist and reactionary post-slavery Deep South. These challenges finally led to his parents’ decision to move to California and pass as white. Throughout the remainder of Part 1, we follow Herriman’s early life and schooling, and his budding interest in a life of drawing comics—opportunities, Tisserand notes, that he may not have had as a “colored” youth in the New Orleans of the time. ON MARCH 4, 1913, Woodrow Wilson took the oath of office and became our 28th president. While we remember Wilson for his internationalist foreign policy and progressive labor laws, he was also the first Southerner elected since the mid-19th century, and his racial policies reflected it. Wilson saw Jim Crow as the necessary remedy to the aftermath of the Civil War. As president, he normalized his revanchist views from the White House by expanding segregation of federal workers. Not surprisingly, 1913 also saw a rebirth of the Ku Klux Klan. An excerpt from Wilson’s revisionist writings proclaiming the Klan “a veritable empire of the South” even appears in D. W. Griffith’s The Birth of a Nation, a box-office smash which Wilson personally screened at the White House, the first American film ever shown there. In that reactionary atmosphere, on October 28, 1913, in the New York Evening Journal, William Randolph Hearst debuted a new comic strip, Krazy Kat, by one of his favorite cartoonists, George Herriman. It starred Krazy, an androgynous cat in love with Ignatz, a brick-throwing, cat-chasing mouse. They lived in Coconino County, Arizona, desert mesa country, and Herriman shifted their backgrounds panel-by-panel — night to day, day to night, mountain to desert to town to river — with no rhyme or reason. They spoke in a patois of slang, Elizabethan English, Yiddish, Spanish, French, and tossed off literary allusions. When asked once about his basic upending of the natural order of cats, mice, dogs, time, and space, Herriman summed up his Weltanschauung: “To me it’s just as sensible as the way it is.”. 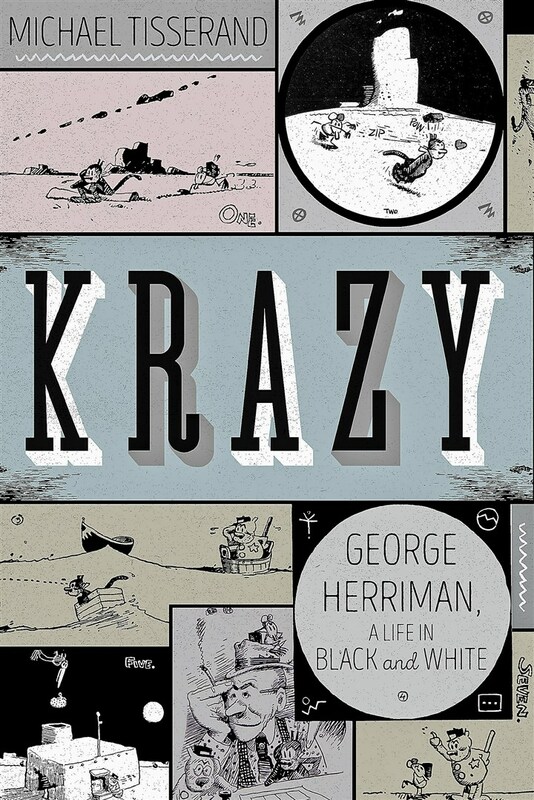 Interview with Michael Tisserand about his book Krazy: George Herriman, a Life in Black and White. Listen to the interview (01:00:00) here. “Krazy: George Herriman, A Life in Black and White” by Michael Tisserand. “Krazy Kat,” created by George Herriman, is one of the most influential comic strips of all time. Centered around the iconic love triangle of Krazy, Ignatz Mouse and Offisa Pupp, the feature ran as a syndicated newspaper strip from 1913 to 1944. To a modern audience the strip can be difficult to understand, if not impenetrable. The pacing and sense of humor of 100 years ago feel foreign to current trends. There are references that were common at the time that are lost to us now. The language used is an idiosyncratic patois of nonsense poetry. The backgrounds, while beautifully rendered, are a constantly changing surreal backdrop. Characters frequently broke the fourth wall, commenting directly on their status as cartoons. The title character, Krazy Kat, was of indeterminate gender, referred to with shifting pronouns, sometimes within the same sentence. As a whole, Krazy Kat was an ongoing challenge to the reader’s perception of definitions and boundaries. Creator George Herriman was born in New Orleans in 1880. In the latter part of the 19th century his family moved to Los Angeles where his father worked as a tailor and George began his art career, eventually becoming one of the most famous and celebrated cartoonists in history. This is a distinction that would not have been possible if the truth of his life had been known at the time. In the 30 Books in 30 Days series leading up to the March 16 announcement of the 2016 National Book Critics Circle award winners, NBCC board members review the thirty finalists. Today, NBCC board member Colette Bancroft offers an appreciation of biography finalist Michael Tisserand’s Krazy: George Herriman, a Life in Black and White (Harper Collins). In a surreal desert landscape, a tiny white mouse throws a brick at the head of a black cat. On impact, the cat lifts lightly off the ground, hearts floating in the air above its lovestruck head. That image, and the story it suggests, might sound slight. But it was the heart and soul of Krazy Kat, a tremendously influential comic strip that ran for more than 30 years at a time when newspaper comic strips were among the most popular American art forms. Michael Tisserand is the author of Krazy: George Herriman, a Life in Black and White. A self-described ‘mutt,’ Obama encouraged us to think about race in ways that erased the color line. But George Herriman, another mutt, and his creation Krazy Kat were there first. A listing of President Barack Obama’s statements about race might start with his campaign speech “A More Perfect Union,” when the self-described son of a “black man from Kenya and a white woman from Kansas” said that the idea that this nation is greater than its parts is seared into his genetic makeup. During his presidency itself, there were the elegant “remarks by the president on Trayvon Martin,” when Obama imagined aloud how the slain Martin might have been his son, and the stirring eulogy for the Reverend Clementa C. Pinckney, slain during the South Carolina church shooting. Writing the biography of a black person who passed for white in 20th-century America adds an extra layer of difficulty to the detective work any biographer must undertake. This is especially true since Herriman seems never to have addressed his deception in his personal writings or confided his feelings about racial identity to family or friends. Writing the biography of a black person who passed for white in 20th-century America adds an extra layer of difficulty to the detective work any biographer must undertake. This is especially true since [George] Herriman seems never to have addressed his deception in his personal writings or confided his feelings about racial identity to family or friends. He claimed he came from a family of bakers and had worked in his youth as a house painter and carnival barker. In truth he was the great-grandson of Stephen Herriman, a married white boat’s captain from Long Island with roots in England, who purchased enslaved workers after settling in Louisiana, and Justine Olivier, a “free woman of color” who engaged in a plaçage relationship in which her lover financially supported her and her two children. Nelson George, “Invisibly Black: A Life of George Herriman, Creator of ‘Krazy Kat’,” The New York Times, January 12, 2017. https://www.nytimes.com/2017/01/12/books/review/krazy-george-herriman-biography-michael-tisserand.html. Comments Off on Writing the biography of a black person who passed for white in 20th-century America adds an extra layer of difficulty to the detective work any biographer must undertake. This is especially true since Herriman seems never to have addressed his deception in his personal writings or confided his feelings about racial identity to family or friends. Illustrated. 545 pp. Harper/HarperCollins Publishers. $35. In our superficially more enlightened age, the phrase “mixed race” has become the accepted term to describe people with parents of different races. In fact the phrase has become a tool of marketers and brand-conscious celebrities to suggest whatever they’re selling is all-inclusive, a living embodiment of diversity. Many take great care in, for example, their Instagram biographies to list their hyphenated backgrounds. But there are limits to the term’s utility, especially for people with African ancestry. Barack Obama was America’s first mixed-race president. His father was Kenyan and his mother a white woman from Kansas. Yet the tawdry racial history of this Republic demanded that he claim blackness as his primary identity because one drop of black blood has always decided your fate in this country. “Mixed race” notwithstanding, an African heritage in America is never just a cool exotic spice; one taste and it becomes all anyone remembers of the meal. This rigid attitude toward race is often enforced by black Americans as fiercely as whites. For them the “mixed race” label, when employed by black people with a nonblack parent or grandparents, seems more a transparent attempt to dodge racial pigeonholing than a heartfelt assertion of identity. Jim Crow, which ended officially in the 1960s, has never been completely dismantled. So attempts to escape its grip, while understandable, create resentment in those unable to slip across the racial boundaries.